The aggregate market value of the voting stock held by non-affiliates of the registrant on June 30, 2017, based on the closing price of $19.50 per share on that date, was approximately $134,934,735. For the purposes of this disclosure only, the registrant has assumed that its directors and executive officers, are the affiliates of the registrant. The registrant has made no determination that such persons are “affiliates” within the meaning of Rule 405 under the Securities Act of 1933. As of February 21, 2018, there were 7,259,912 shares of the registrant’s common stock outstanding. DOCUMENTS INCORPORATED BY REFERENCE Part III of this Form 10-K incorporates by reference portions of the Company’s definitive Proxy Statement for the 2018 Annual Meeting of Stockholders. The statements contained in this Annual Report on Form 10-K (“Form 10-K”) of Universal Stainless & Alloy Products, Inc. (“Universal,” the “Company,” “us,” “our,” or “we”), including, but not limited to, the statements contained in Item 1, “Business,” and Item 7, “Management's Discussion and Analysis of the Financial Condition and Results of Operations,” along with statements contained in other reports that we have filed with the Securities and Exchange Commission (the “SEC”), external documents and oral presentations, which are not historical facts are considered to be "forward-looking statements" within the meaning of Section 27A of the Securities Act of 1933, as amended, and Section 21E of the Securities Act of 1934, as amended. These statements which may be expressed in a variety of ways, including the use of forward looking terminology such as “believe,” “expect,” “seek,” “intend,” “may,” “will,” “should,” “could,” “potential,” “continue,” “estimate,” “plan,” or “anticipate,” or the negatives thereof, other variations thereon or compatible terminology, relate to, among other things, statements regarding future growth, cost savings, expanded production capacity, broader product lines, greater capacity to meet customer quality reliability, price and delivery needs, enhanced competitive posture, and the effect of new accounting pronouncements. We do not undertake any obligation to publicly update any forward-looking statements. These forward-looking statements, and any forward looking statements contained in other public disclosures of the Company which make reference to the cautionary factors contained in this Form 10-K, are based on assumptions that involve risks and uncertainties and are subject to change based on the considerations described below. We discuss many of these risks and uncertainties in greater detail in Item 1A, “Risk Factors,” of this Form 10-K. These and other risks and uncertainties may cause our actual results, performance or achievements to differ materially from anticipated future results, performance or achievements expressed or implied by such forward-looking statements. Universal, which was incorporated in 1994, and its wholly-owned subsidiaries, manufacture and market semi-finished and finished specialty steel products, including stainless steel, nickel alloys, tool steel and certain other premium alloyed steels. Our manufacturing process involves melting, remelting, heat treating, hot and cold rolling, forging, machining and cold drawing of semi-finished and finished specialty steels. Our products are sold to service centers, forgers, rerollers, original equipment manufacturers (“OEMs”) and wire redrawers. Our customers further process our products for use in a variety of industries, including the aerospace, power generation, oil and gas, heavy equipment and general industrial markets. We also perform conversion services on materials supplied by customers. We operate in four locations: Bridgeville and Titusville, Pennsylvania; Dunkirk, New York; and North Jackson, Ohio. Our corporate headquarters is located at our Bridgeville location. We operate these four manufacturing locations as one reportable business segment. We produce a wide variety of specialty steel grades using several manufacturing processes including argon oxygen decarburization (“AOD”), electro-slag remelted (“ESR”), vacuum induction melting (“VIM”) and vacuum-arc remelted (“VAR”). At our Bridgeville and North Jackson facilities, we produce specialty steel products in the form of semi-finished and finished long products (ingots, blooms, billets and bars). In addition, the Bridgeville facility produces flat rolled products (slabs and plates). Semi-finished long products are primarily used by our Dunkirk facility and certain customers to produce finished bar, rod, and wire products. Finished bar products that we manufacture are primarily used by OEMs and by service center customers for distribution to a variety of end users. We also produce customized shapes primarily for OEMs that are cold rolled from purchased coiled strip, flat bar or extruded bar at our precision rolled products department, located at our Titusville facility. The specialty steel industry is a relatively small but distinct segment of the overall steel industry. Specialty steels include stainless steels, nickel alloys, tool steels, electrical steels, high-temperature alloys, magnetic alloys and electronic alloys. Specialty steels are made with a high alloy content, suitable for use in environments that demand exceptional hardness, toughness, strength and resistance to heat, corrosion or abrasion, or combinations thereof. Specialty steels generally must conform to more demanding customer specifications for consistency, straightness and surface finish than carbon steels. For the years ended December 31, 2017, 2016 and 2015, approximately 69% or more of our net sales were derived from stainless steel products. Stainless Steel. Stainless steel, which represents the largest part of the specialty steel market, contains elements such as nickel, chrome and molybdenum that give it the unique qualities of high strength, good wear characteristics, natural attractiveness, ease of maintenance and resistance to corrosion and heat. Stainless steel is used, among other applications, in the aerospace, oil and gas, power generation and automotive industries, as well as in the manufacturing of equipment for food handling, health and medical, chemical processing and pollution control. High-Strength Low Alloy Steel. High-strength low alloy steel is a relative term that refers to those steels that maintain alloying elements that range in versatility. The alloy elements of nickel, chrome and molybdenum in such steels typically exceeds the alloy element of carbon steels but not that of high-temperature alloy steel. High-strength low alloy steels are manufactured for use generally in the aerospace industry. Tool Steel. Tool steels contain elements of nickel, chrome and molybdenum to produce specific hardness characteristics that enable tool steels to form, cut, shape and shear other materials in the manufacturing process. Heating and cooling at precise rates in the heat-treating process bring out these hardness characteristics. Tool steels are utilized in the manufacturing of metals, plastics, paper and aluminum extrusions, pharmaceuticals, electronics and optics. High-Temperature Alloy Steel. These steels are designed to meet critical requirements of heat resistance and structural integrity. They generally have very high nickel content relative to other types of specialty steels. High-temperature alloy steels are manufactured for use generally in the aerospace industry. We depend on the delivery of key raw materials for our day-to-day operations. These key raw materials are carbon and stainless scrap metal and alloys, primarily consisting of nickel, chrome, molybdenum, and copper. Scrap metal is primarily generated by industrial sources and is purchased through a number of scrap brokers and processors. We also recycle scrap metal generated from our own production operations as a source of metal for our melt shops. Alloys are generally purchased from domestic agents and originate in the United States, Australia, Canada, China, Russia, South America and South Africa. Our Bridgeville and North Jackson facilities currently supply semi-finished specialty steel products as starting materials to our other operating facilities. Semi-finished specialty steel starting materials, which we cannot produce at a competitive cost, are purchased from other suppliers. We generally purchase these starting materials from steel strip coil suppliers, extruders, flat rolled producers and service centers. We believe that adequate supplies of starting material will continue to be available. The cost of raw materials represents approximately 45% of the cost of products sold in 2017, and approximately 40% and 50%, respectively, of the cost of products sold in 2016 and 2015. Raw material costs can be impacted by significant price changes. Raw material prices vary based on numerous factors, including quality, and are subject to frequent market fluctuations. Future raw material prices cannot be predicted with any degree of certainty. We do not maintain any fixed-price long-term agreements with any of our raw material suppliers. We maintain a sales price surcharge mechanism on certain of our products to match sales prices to raw material price changes. For certain products, the surcharge is calculated at the time of order entry, based on current raw material prices or prices at the time of shipment. For certain finished products, the surcharge is calculated based on the monthly average raw material prices two months prior to the promised ship date. Our largest customer in 2017, Reliance Steel & Aluminum Co., accounted for approximately 17%, 20% and 16% of our net sales for the years ended December 31, 2017, 2016 and 2015, respectively. No other customer accounted for more than 10% of our net sales for the years ended December 31, 2017, 2016 and 2015. International sales approximated 9% of 2017, 2016 and 2015 annual net sales. Our backlog of orders (excluding surcharges) on hand as of December 31, 2017 was approximately $77.7 million compared to approximately $43.8 million at December 31, 2016. We believe that this 77.4% increase in our backlog is largely a result of increased demand for our products due to an improved market and to a lesser extent market share gains. Our backlog may not be indicative of actual sales because certain surcharges are not determinable until the order is shipped to the customer and, therefore, should not be used as a direct measure of future revenue. However, we expect that our actual sales will be higher than the backlog once the actual surcharges are determined. Competition in our markets is based upon product quality, delivery capability, customer service, customer approval and price. Maintaining high standards of product quality, while responding quickly to customer needs and keeping production costs at competitive levels, is essential to our ability to compete in these markets. We believe that there are several companies that manufacture one or more similar specialty steel products that are significant competitors. There are a few smaller producing companies and material converters that are also considered to be competitors of ours. High import penetration of specialty steel products, especially stainless and tool steels, also impacts the competitive nature within the United States. Unfair pricing practices by foreign producers have resulted in high import penetration into the U.S. markets in which we participate. We consider the maintenance of good relations with our employees to be important to the successful conduct of our business. We have profit-sharing plans for certain salaried and hourly employees and for all of our employees represented by United Steelworkers (the “USW”) and have equity ownership programs for all of our eligible employees, in an effort to forge an alliance between our employees’ interests and those of our stockholders. At December 31, 2017, 2016 and 2015, we had 703, 645, and 634 employees, respectively, of which 564, 508, and 449, respectively, were USW members. We believe a critical component of our collective bargaining agreements is the inclusion of a profit sharing plan. We maintain a 401(k) retirement plan for our hourly and salaried employees. Pursuant to the 401(k) plan, participants may elect to make pre-tax and after-tax contributions, subject to certain limitations imposed under the Internal Revenue Code of 1986, as amended. In addition, we make periodic contributions to the 401(k) plan for the hourly employees employed at the Dunkirk and Titusville facilities, based on service, and at the North Jackson facility, based upon the employee’s age and wage rate. We make periodic contributions for the salaried employees at all locations, except for North Jackson, based upon their service and their individual contribution to the 401(k) retirement plan. For North Jackson salaried employees, we make periodic contributions based upon the employee’s age, annual salary, and their individual contributions. We participate in the Steelworkers Pension Trust (the “Trust”), a multi-employer defined-benefit pension plan that is open to all hourly and salaried employees associated with the Bridgeville facility. We make periodic contributions to the Trust based on hours worked at a fixed rate for each hourly employee and a fixed monthly contribution on behalf of each salaried employee. We also provide group life and health insurance plans for our hourly and salary employees. Under the 1996 Employee Stock Purchase Plan, as amended (the “Plan”), the Company is authorized to issue up to 300,000 shares of common stock to its full-time employees, nearly all of whom are eligible to participate. Under the terms of the Plan, employees can choose as of January 1 and July 1 of each year to have up to 10% of their total earnings withheld to purchase up to 100 shares of our common stock each six-month period. The purchase price of the stock is 85% of the lower of its beginning-of-the-period or end-of-the-period market prices. At December 31, 2017, we have issued 212,089 shares of common stock since the Plan’s inception. We are subject to federal, state and local environmental laws and regulations (collectively, “Environmental Laws”), including those governing discharges of pollutants into the air and water, and the generation, handling and disposal of hazardous and non-hazardous substances. We monitor our compliance with applicable Environmental Laws and, accordingly, believe that we are currently in compliance with all laws and regulations in all material respects. We are subject periodically to environmental compliance reviews by various regulatory offices. We may be liable for the remediation of contamination associated with generation, handling and disposal activities. Environmental costs could be incurred, which may be significant, related to environmental compliance, at any time or from time to time in the future. Dennis M. Oates has been President and Chief Executive Officer of the Company since 2008. Mr. Oates was named to the Company’s Board of Directors in 2007. Mr. Oates previously served as Senior Vice President of the Specialty Alloys Operations of Carpenter Technology Corporation from 2003 to 2007. Mr. Oates also served as President and Chief Executive Officer of TW Metals, Inc. from 1998 to 2003. In May 2010, the Board of Directors elected Mr. Oates to the additional position of Chairman. Christopher M. Zimmer has been Executive Vice President and Chief Commercial Officer since July 2014. Mr. Zimmer served as Vice President of Sales and Marketing from 2008 to July 2014. Mr. Zimmer previously served as Vice President of Sales and Marketing for Schmoltz+Bickenbach USA from 1995 to 2008. He held positions of increasing responsibility including inside sales, Commercial Manager—stainless bar, General Manager—nickel alloy products, and National Sales Manager. Paul A. McGrath has been Vice President of Administration of the Company since 2007, General Counsel since 1995 and was appointed Secretary in 1996. Mr. McGrath served as Vice President of Operations from 2001 to 2006. Previously, he was employed by Westinghouse Electric Corporation for approximately 24 years in various management positions. Graham McIntosh, Ph.D. has been Vice President and Chief Technology Officer since November 2015. Dr. McIntosh previously served as Director of Global Technology Initiatives for Carpenter Technology Corporation where he joined in 2008. Dr. McIntosh also served as Vice President of Technology and Director of Quality for Firth Rixson Viking from 2001 to 2008, and also held several management and technical positions at Wyman-Gordon Livingston from 1987-2001, where he began his career. The Company is actively recruiting a Chief Financial Officer. We do not consider our business to be materially dependent on patent or trademark protection, and believe we own or maintain effective licenses covering all the intellectual property used in our business. We benefit from our proprietary rights relating to designs, engineering and manufacturing processes and procedures. We seek to protect our proprietary information by use of confidentiality and non-competition agreements with certain employees. Copies of our Annual Report on Form 10-K, Quarterly Reports on Form 10-Q, current reports on Form 8-K, and any amendments to those reports, as well as proxy and information statements that we file with the SEC, are available free of charge on our website at www.univstainless.com as soon as reasonably practicable after such reports are filed with the SEC. The contents of our website are not part of this Form 10-K. Copies of these documents will be available to any shareholder upon request. Requests should be directed in writing to Investor Relations at 600 Mayer Street, Bridgeville, PA 15017. You also may read and copy any materials we file with the SEC at the SEC’s Public Reference Room at 100 F Street, NE, Washington, DC 20549. You may obtain information on the operation of the Public Reference Room by calling the SEC at 1-800-SEC-0330. The SEC maintains an Internet site at www.sec.gov that contains reports, proxy and information statements and other information regarding issuers, like us, that file electronically with the SEC. We wish to caution each reader of this Form 10-K to consider the following factors and other factors discussed herein and in other past reports, including but not limited to prior year Form 10-K and Form 10-Q reports filed with the SEC. Our business and results of operations could be materially affected by any of the following risks. The factors discussed herein are not exhaustive. Therefore, the factors contained herein should be read together with other reports that we file with the SEC from time to time, which may supplement, modify, supersede, or update the factors listed in this document. A substantial amount of our sales are derived from a limited number of customers. Our five largest customers in the aggregate accounted for approximately 41% of our net sales for the year ended December 31, 2017, and 42% of our net sales for the years ended December 31, 2016 and 2015. The accounts receivable balance from these five customers comprised approximately 35% of total accounts receivable at December 31, 2017. An adverse change in, or termination of, the relationship with one or more of our customers or market segments could have a material adverse effect on our results of operations. Our business is very competitive, and increased competition could reduce our sales. We compete with domestic and foreign producers of specialty steel products. In addition, many of the finished products sold by our customers are in direct competition with finished products manufactured by foreign sources, which may affect the demand for those customers’ products. Any competitive factors that adversely affect the market for finished products manufactured by us or our customers could indirectly adversely affect the demand for our semi-finished products. Additionally, our products compete with products fashioned from alternative materials such as aluminum, composites and plastics, the production of which includes domestic and foreign enterprises. Competition in our field is intense and is expected to continue to be so in the foreseeable future. A majority of our business is not covered under long term supply contracts. There can be no assurance that we will be able to compete successfully in the future. A substantial amount of our sales are derived from the aerospace industry. Approximately 55% of our sales and 42% of our tons shipped represented products sold to customers in the aerospace market in 2017. The aerospace market is historically cyclical due to both external and internal market factors. These factors include general economic conditions, supply chain fluctuations, diminished credit availability, airline profitability, demand for air travel, age of fleets, varying fuel and labor costs, price competition, new technology development and international and domestic political conditions such as military conflict and the threat of terrorism. The length and degree of cyclical fluctuation can be influenced by any one or a combination of these factors and therefore are difficult to predict with certainty. While the aerospace industry is currently experiencing growth, a downturn in the aerospace industry would adversely affect the demand for products and/or the prices at which we are able to sell our products, and our results of operations, business and financial condition could be materially adversely affected. Our business may be harmed by failure to develop, commercialize, market and sell new applications and new products. We believe that our alloys and metallurgical manufacturing expertise provide us with a competitive advantage over other high-performance alloy producers. Our ability to maintain this competitive advantage depends on our ability to continue to offer products that have equal or better performance characteristics than competing products at competitive prices. Our future growth will depend, in part, on our ability to address the increasingly demanding needs of our customers by enhancing the properties of our existing alloys, by timely developing new applications for our existing products, and by timely developing, commercializing, marketing and selling new products. If we are not successful in these efforts, or if our new products and product enhancements do not adequately meet the requirements of the marketplace and achieve market acceptance, our business could be adversely affected. Our business requires continuing efforts to obtain new customer approvals on existing products and applications, which is a stringent, difficult process subject to each customer’s varying approval methodology and preferences. If we are not successful in these efforts, our business could be adversely affected. We are dependent on the availability and price of raw materials and operating supplies. We purchase carbon and stainless scrap metal and alloy additives, principally nickel, chrome, molybdenum, manganese and copper, for our melting operation. A substantial portion of the alloy additives is available only from foreign sources, some of which are located in countries that may be subject to unstable political and economic conditions. Those conditions might disrupt supplies or affect the prices of the raw materials. We maintain sales price surcharges on certain of our products to help offset the impact of raw material price fluctuations. We do not maintain long-term fixed-price supply agreements with any of our raw material suppliers. If our supply of raw materials were interrupted, we might not be able to obtain sufficient quantities of raw materials, or obtain sufficient quantities of such materials at satisfactory prices, which, in either case, could adversely affect our results of operations. In addition, significant volatility in the price of our principal raw materials could adversely affect our financial results and there can be no assurance that the raw material surcharge mechanism employed by us will completely offset immediate changes in our raw material costs. Our production processes require consumable operating supplies, such as electrodes, which have increased in price significantly compared to prior years. Significant volatility in the price of our consumable operating supplies could adversely affect our financial results. Our business requires substantial amounts of energy. The manufacturing of specialty steel is an energy-intensive process and requires the ready availability of substantial amounts of electricity and natural gas, for which we negotiate competitive supply agreements. While we believe that our energy agreements allow us to compete effectively within the specialty steel industry, the potential for increased costs exists during periods of high demand or supply disruptions. We have a sales price surcharge to help offset the cost fluctuations. We are subject to risks associated with global economic and market factors. Our results of operations are affected directly by the level of business activity of our customers, which in turn is affected by global economic and market factors impacting the industries and markets that we serve. We are susceptible to macroeconomic downturns in the United States and abroad that may affect the general economic climate, our performance and the demand of our customers. We may face significant challenges if conditions in the financial markets deteriorate. There can be no assurance that global economic and market conditions will not adversely impact our results of operations, cash flow or financial position in the future. Our business depends largely on our ability to attract and retain key personnel. We depend on the continued service, availability and ability to attract skilled personnel, including members of our executive management team, other management positions, and metallurgists, along with maintenance and production positions. Our inability to attract and retain such people may adversely impact our ability to fill existing roles and support growth. Attraction and retention of qualified personnel has become more challenging as the labor market tightens. Further, the loss of key personnel could adversely affect our ability to perform until suitable replacements can be found. The Company is currently using qualified temporary resources to maintain its effectiveness and internal control environment within the Finance function while a new Chief Financial Officer is being actively recruited. Our business may be harmed by strikes or work stoppages. At December 31, 2017, we had 513 employees, out of a total of 703, who were covered under collective bargaining agreements expiring at various dates in 2018 to 2022. On March 4, 2016, the USW was certified as the exclusive bargaining representative for the hourly employees of our North Jackson facility. The Company and the Union are currently negotiating the initial collective bargaining agreement for the North Jackson hourly employees. There can be no assurance that we will be successful in timely concluding collective bargaining agreements with the USW to succeed the agreements that expire, in which case, we may experience strikes or work stoppages that may have a material adverse impact on our results of operations. Our business may be harmed by failures on critical manufacturing equipment. Our manufacturing processes are dependent upon certain critical pieces of specialty steel making equipment, such as our 50-ton electric-arc furnace and AOD vessel, our ESR, VIM and VAR furnaces, our radial hydraulic forge and our universal rolling mill. In the event a critical piece of equipment should become inoperative as a result of unexpected equipment failure, there can be no assurance that our operations would not be substantially curtailed, which may have a negative effect on our financial results. Our business may be harmed if we are unable to meet our debt service requirements or the covenants in our credit agreement or if interest rates increase. We have debt upon which we are required to make scheduled interest and principal payments, and we may incur additional debt in the future. A significant portion of our debt bears interest at variable rates that may increase in the future. Our ability to satisfy our debt obligations, and our ability to refinance any of our indebtedness in the future if we determine that doing so would be advisable, will depend upon our future operating performance, which will be affected by prevailing economic conditions in the markets that we serve and financial, business and other factors, many of which are beyond our control. If we are unable to generate sufficient cash to service our debt or if interest rates increase, our results of operations and financial condition could be adversely affected. Our credit agreement, which provides for a $65.0 million senior secured revolving credit facility and a $30.0 million senior secured term loan facility, also requires us to comply with certain covenants. A failure to comply with the covenants contained in the credit agreement could result in a default, which, if not waived by our lenders, could substantially increase our borrowing costs and result in acceleration of our debt. As of December 31, 2017, we were in compliance with the covenants in our credit agreement. We believe that our international sales are associated with various risks. We conduct business with suppliers and customers in foreign countries which exposes us to risks associated with international business activities. We could be significantly impacted by those risks, which include the potential for volatile economic and labor conditions, political instability, collecting accounts receivable and exchange rate fluctuations (which may affect sales revenue to international customers and the margins on international sales when converted into U.S. dollars). If we are unable to protect our information technology infrastructure against service interruptions, data corruption, cyber-based attacks or network security beaches, our operations could be disrupted. We rely on information technology networks and systems to manage and support a variety of business activities, including procurement and supply chain, engineering support, and manufacturing. Our information technology systems, some of which are managed by third-parties, may be susceptible to damage, disruptions or shutdown due to failures during the process of upgrading or replacing software, databases or components thereof, power outages, hardware failures, computer viruses, attacks by computer hackers, telecommunications failures, user errors or catastrophic events. In addition, security breaches could result in unauthorized disclosures of confidential information. If our information technology systems suffer severe damage, disruption or shutdown and our business continuity plans do not effectively resolve the issues in a timely manner, our manufacturing process could be disrupted resulting in late deliveries or even no deliveries if there is a total shutdown. Changes in tax rules and regulations, or interpretations thereof, may adversely affect our effective tax rates. We are a U.S. based company with customers and suppliers in foreign countries. We import various raw materials used in our production processes and we export goods to our foreign customers. The United States, the European Commission, countries in the EU and other countries where we do business have been implemented and may consider further changes in relevant tax, border tax, accounting and other laws, regulations and interpretations, that may unfavorably impact our effective tax rate or result in other costs to us. Our business subjects us to risk of litigation claims, as a routine matter, and this risk increases the potential for a loss that might not be covered by insurance. Litigation claims may relate to the conduct of our business, including claims relating to product liability, commercial disputes, employment actions, employee benefits, compliance with domestic and federal laws and personal injury. Due to the uncertainties of litigation, we might not prevail on claims made against us in the lawsuits that we currently face, and additional claims may be made against us in the future. The outcome of litigation cannot be predicted with certainty, and some of these lawsuits, claims or proceedings may be determined adversely to us. The resolution in any reporting period of one or more of these matters could have a material adverse effect on our business. We own our Bridgeville, Pennsylvania facility, which consists of approximately 760,000 square feet of floor space and our executive offices on approximately 74 acres. The Bridgeville facility contains melting, remelting, conditioning, rolling, annealing and various other processing equipment. Substantially all products shipped from the Bridgeville facility are processed through its melt shop and universal rolling mill operations. We own our North Jackson, Ohio facility, which consists of approximately 257,000 square feet of floor space on approximately 110 acres. The North Jackson facility contains melting, remelting, forging, annealing and various other processing operations. Our obligations under our credit agreement, which is more fully described under Item 7, “Management’s Discussion and Analysis of Financial Condition and Results of Operations - Liquidity and Capital Resources,” are collateralized by a first lien on our real property in North Jackson, Ohio. Also, our obligations under the Notes, also more fully described under Item 7, “Management’s Discussion and Analysis of Financial Condition and Results of Operations - Liquidity and Capital Resources,” are collateralized by a second lien on our North Jackson, Ohio real property. We own our Dunkirk, New York facility, which consists of approximately 680,000 square feet of floor space on approximately 81 acres. The Dunkirk facility processes semi-finished billet and bar stock through one or more of its five rolling mills, a high temperature annealing facility and/or a round or shape bar finishing facility. We own our Titusville, Pennsylvania facility, which consists of seven buildings on approximately 10 acres, including two principal buildings of approximately 265,000 square feet in total area. The Titusville facility contains five VAR furnaces and various rolling and finishing equipment. Specialty steel production is a capital-intensive industry. We believe that our facilities and equipment are suitable for our present manufacturing needs. We believe, however, that we will continue to require capital from time to time to add new equipment and to repair or replace our existing equipment to remain competitive and to enable us to manufacture quality products and provide delivery and other support service assurances to our customers. From time to time, various lawsuits and claims have been or may be asserted against us relating to the conduct of our business, including routine litigation relating to commercial and employment matters. The ultimate cost and outcome of any litigation or claim cannot be predicted with certainty. We believe, based on information presently available, that the likelihood that the ultimate outcome of any such pending matter will have a material adverse effect on our financial condition, or liquidity or a material impact to our results of operations is remote, although the resolution of one or more of these matters may have a material adverse effect on our results of operations for the period in which the resolution occurs. At December 31, 2017, a total of 7,550,642 shares of common stock, par value $0.001 per share, were issued and held by approximately 99 holders of record. There were 292,855 shares of the issued common stock held in treasury at December 31, 2017. Certain holders of our common stock and the Company are party to a stockholder agreement. That agreement maintains in effect certain registration rights granted to certain stockholders and provides to them two demand registration rights exercisable at any time upon written request for the registration of shares of common stock having an aggregate net offering price of at least $5.0 million. 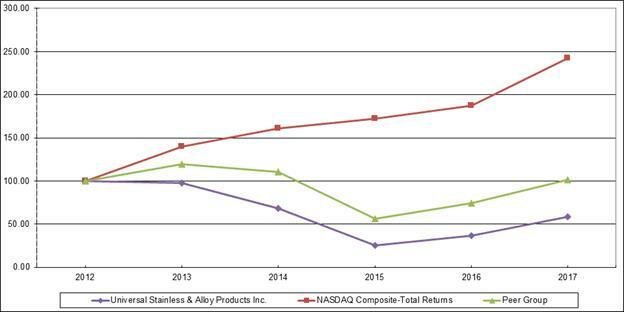 The performance graph below compares the cumulative total stockholder return on our common stock with the cumulative total return on the equity securities of the NASDAQ Composite Index and a peer group selected by us. The peer group consists of domestic specialty steel producers: Allegheny Technologies Incorporated; Materion Corporation; Carpenter Technology Corporation; and Haynes International, Inc. The graph assumes an investment of $100 on December 31, 2012 reinvestment of dividends, if any, on the date of dividend payment and the peer group is weighted by each company’s market capitalization. The performance graph represents past performance and should not be considered to be an indication of future performance. Our Certificate of Incorporation provides that we may, by vote of our Board of Directors, issue up to 1,980,000 shares of preferred stock. The preferred stock may have rights, preferences, privileges and restrictions thereon, including dividend rights, dividend rates, conversion rights, voting rights, terms of redemption, redemption prices, liquidation preferences and the number of shares constituting any series or designation of such series, without further vote or action by the stockholders. The issuance of preferred stock may have the effect of delaying, deferring or preventing a change in control of the Company without further action by the stockholders and may adversely affect the voting and other rights of the holders of common stock. The issuance of preferred stock with voting and conversion rights may adversely affect the voting power of the holders of common stock, including the loss of voting control to others. We have no outstanding preferred stock and have no current plans to issue any of the authorized preferred stock. We have never paid a cash dividend on our common stock. Our credit agreement does not permit the payment of cash dividends on our common stock. Total assets and Long-term debt, for prior periods, have been adjusted to reflect the reclassification of deferred financing costs from Other long-term assets to a reduction of debt to be consistent with the current period presentation due to the adoption of ASC 2015-3, “Simplifying the Presentation of Debt Issuance Costs”. The following Management Discussion and Analysis (“MD&A”) is intended to help the reader understand the consolidated results of operations and financial condition of Universal Stainless & Alloy Products, Inc. and its wholly-owned subsidiaries (collectively, “we,” “us,” “our,” or the “Company”). This MD&A should be read in conjunction with our consolidated financial statements and accompanying notes included in this Form 10-K. When reviewing the discussion, you should keep in mind the substantial risks and uncertainties that characterize our business. In particular, we encourage you to review the risk and uncertainties described under Item 1A “Risk Factors,” of this Form 10-K. These risks and uncertainties could cause actual results to differ materially from those forecasted in forward-looking statements or implied by past results and trends. Forward-looking statements are statements that attempt to project or anticipate future developments in our business; we encourage you to review the discussion of forward-looking statements under “Cautionary Statement for Purposes of the “Safe Harbor” Provisions of the Private Securities Litigation Reform Act of 1995,” at the beginning of this report. These statements, like all statements in this report, speak only as of the date of this report (unless another date is indicated), and we undertake no obligation to update or revise the statements in light of future developments. Unless otherwise specified, any reference to a “year” is to the year ended December 31. We manufacture and market semi-finished and finished specialty steel products, including stainless steel, nickel alloys, tool steel and certain other alloyed steels. Our manufacturing process involves melting, remelting, heat treating, hot and cold rolling, forging, machining and cold drawing of semi-finished and finished specialty steels. Our products are sold to service centers, forgers, rerollers, original equipment manufacturers and wire redrawers. Our customers further process our products for use in a variety of industries, including the aerospace, power generation, oil and gas and general industrial markets. We also perform conversion services on materials supplied by customers. The improvements in our end markets which began in the second half of 2016 continued in 2017. For full year 2017, all of our end markets were up, compared with full year 2016. Better surcharge alignments positively impacted all of our end markets. Aerospace was up in 2017 due to strong customer demand, and heavy equipment was up due to higher manufacturing activity. Our overall net sales were $202.6 million, an increase of $48.2 million, or 31.2%, compared to 2016. Sales in each quarter of 2017 were higher than the comparable 2016 period. Backlog at the end of 2017, before surcharges, was $77.7 million, an increase of approximately 77.4% compared to a backlog of $43.8 million at the end of 2016. In 2017, we received 10 new customer approvals that are critical to our focus on the aerospace, oil & gas and power generation end markets. In addition, we added 12 new products in 2017, with an additional 15 new products in the development process at the end of 2017. New product introductions are essential to move to a higher value product mix. We continue to work on gaining other customer approvals to add more products, with a focus on high value nickel alloy products. For 2017, our gross margin was 11.4% of net sales, improved from 8.8% of net sales in 2016. Operational productivity enhancements, combined with improved alignment of customer surcharges and melt cost over the course of 2017, drove the gross margin improvement. Gross margin in the first half of 2016 was negatively impacted by continued misalignment of customer surcharges and melt costs. In the fourth quarter of 2017, gross margin was $6.2 million, or 12.3% of sales, compared to a gross margin of $3.1 million, or 9.1% of sales, in the fourth quarter of 2016. Selling, general and administrative (“SG&A”) expenses increased by $1.3 million in 2017, compared to 2016. The increase in SG&A was driven by higher employee costs associated with the increased business levels and higher legal costs. These increases in SG&A were partially offset by $0.6 million less variable compensation expense in 2017 compared to 2016. Overall, our operating income in 2017 was $4.2 million, compared to an operating loss of $4.0 million in 2016, reflecting the improved operational results in 2017. The 2017 income tax benefit of $7.6 million reflects a one-time adjustment due to the recently enacted tax rate reduction, fractionally offset by state tax items and new stock compensation accounting guidance for 2017. During 2017, we generated $1.1 million cash from operating activities, and incurred $8.0 million of capital spending which was partially offset by proceeds of $0.1 million received for asset sales. Financing activities generated $7.0 million primarily from net additional borrowings. Total debt under the revolving credit facility increased $11.5 million, offset by $5.1 million of payments on the term loan and capital leases. The overall demand environment continues to improve as we enter 2018 with service centers, forgers and re-rollers all signaling improved outlooks now that the pressure for our customers to reduce year-end inventories has passed. We remain optimistic about near and long-term aerospace end market growth given the multi-year backlog in airplane deliveries and sustained growth in passenger and air freight traffic. In addition, we are optimistic about our other end markets as we expect strong heavy equipment end market demand and see strengthening of the oil and gas end market as we enter 2018. Our operating facilities are integrated, and therefore our chief operating decision maker (“CODM”) views the Company as one business unit. Our CODM sets performance goals, assesses performance and makes decisions about resource allocations on a consolidated basis. As a result of these factors, as well as the nature of the financial information available which is reviewed by our CODM, we maintain one reportable segment. The majority of our products are sold to service centers rather than the ultimate end market customers. The end market information in this Annual Report is our estimate based upon our knowledge of our customers and the grade of material sold to them, that they will in-turn sell to the ultimate end market customer.